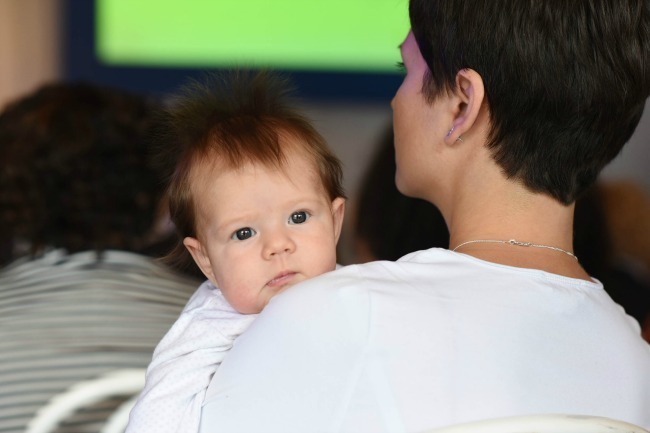 When I had my first son I heard briefly about baby massage and gave it a try once or twice, but wasn’t quite sure how to go about it so I gave up. Because I kept hearing about the benefits of massage for babies, however, I decided to take a baby massage course when my second son was an infant. I was surprised to learn that baby massage is actually not complicated or hard. Mostly it is about gently touching your baby and being aware of how they respond. Sure, there are certain strokes and methods that are nice – but really, if you are just getting started, simply doing what comes naturally is fine. I massage my baby girl (my third baby) most every day and we both LOVE it! 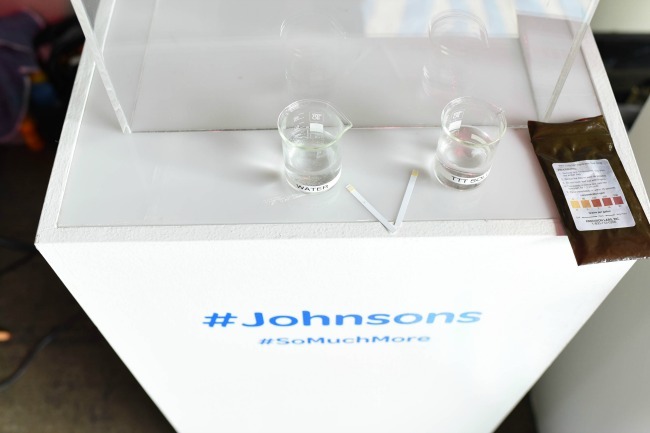 A few weeks ago, I attended an event to celebrate the JOHNSON’S® SO MUCH MORE™ movement which reminds parents that everyday rituals like bath time can include massage to enhance healthy baby development. These everyday rituals allow us to interact with our babies and stimulate their senses, and are moments that we should cherish. (1) Massage uses baby’s first sensory stimulation – touch – which first started in the womb. (2) By age three, 85% of a baby’s brain is developed. Every experience leading up to this time – such as interactions with caregivers – helps to shape baby’s brain. (3) Baby massage oil or lotion can reduce friction as you massage your baby, and will also add the sense of smell to your massage time. Offering multi-sensorial experiences (touch + smell) are all part of happy, healthy baby development. (4) Massage is the perfect time for infants to make eye contact with their caregivers, which is one of the earliest forms of communication. (5) Massage gives babies the opportunity to interact with and relate to others. Siblings can learn to interact and relate with the new baby in their house through massage as well! My boys (ages 4 and 6) love giving our baby gentle foot massages. It’s a great time to teach them empathy by observing the baby’s expressions to see if she’s enjoying the massage, or not. (6) There’s no right way or technique to do a baby massage. The most important thing to do is to watch your baby’s responses. They will show you what they like or don’t like! Check out this page if you want some ideas on different baby massage techniques. (7) Giving massage a go is better than not trying it because you are too scared to do something “wrong.” You will learn more as you try! (8) You don’t have to spend a long time to give your baby a massage. It can last just a few minutes before or after bath time or a nappy change. (9) Massage can but doesn’t have to be done as part of a regular routine. A few times a week is fine, if you can’t fit it into your daily schedule. And it’s never too late to start! Even older children love massages, too. (10) Research has found that routine massage can lead to increased alertness and attentiveness. It was interesting to learn about how JOHNSON’S® has done a lot of research exploring the topic of multi-sensorial experiences for baby. The studies talk about how the role of gentle touch, such as massage or during bath time, combined with a familiar and pleasant scent can contribute to healthy baby development. JOHNSON’S® are a leader in advancing the science of baby skincare and they are partnering with global experts to set standards in baby skincare. 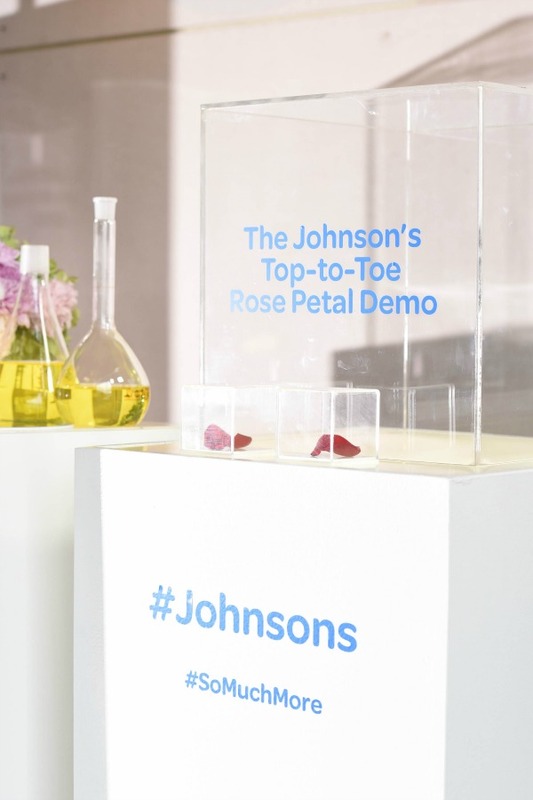 At the event I attended, there were several interactive stations which gave guests the opportunity to find out about the importance of smell, how you can interact with your baby during bath time, the basics of infant massage, and the formulation and testing of JOHNSON’S® products. I had honestly never given much thought to bath time products, and thought that water on its own was probably preferable. It really surprised me to find out that Top-to-Toe actually softens water hardness! I had no idea that you are actually supposed to mix the product into the water, and not just use it like a regular soap! It was also very impressive to see an experiment where regular water and water with Top-to-Toe were used to clean Nutella off a rose petal! Not only was the formulation with Top-to-Toe more effective, but it did not penetrate the petal like the regular water did. No wonder the product is so gentle on babies skin. I’m looking forward to doing some more sensory focused bath time and massage with my bub, and getting my older kids involved as well! There are so many different scents to try – I know they will all enjoy it. It was really nice to be reminded that our babies are only small for so long… and they are learning so much every day. Spending just five extra minutes to bond through touch and sensory experiences with our babies is a lifelong gift to them, and to us as parents. Have you tried baby massage? Do you treat bath time as a “must do” or a special time to bond with your bub? This is a sponsored post brought to you by Nuffnang and JOHNSON’S®. All opinions are my own. To read more about reviews on my website, visit this page. When my girls were babies, we used the Johnsons scented bath gel in the evenings before bed and sometimes added massage. The scent was relaxing and whenever I smell this lotion it reminds me of these moments. What gorgeous memories 🙂 It’s just like smelling cookies or bread baking, those scents – bringing back memories! I LOVE the lavender one. Definitely harder to slow down with three kids, I feel you! It’s really cute to see the boys wanting to get involved in massaging the baby… very sweet memories being created. We love taking the time to do baby massage. It can actually be a little challenging when you have another child to juggle, however, I just make it a team effort and it’s lovely to see both my children connect through massage. Such lovely pics Chelsea! I have such fond memories of massage time when Charlie was a bub. It was such a beautiful way to bond. I can’t wait for my new little bub now! I was lucky i was given Johnson’s booklet on massaging baby from a friend during my first-born. I usually massage my children with some massaging oil and lotion, while saying some prayers as I do it. As you said massage is such a nice opportunity to make the bond between yourself and your baby even stronger. I just started doing it the same way I like to be massaged and it worked. I believe the small babies feel it the same way we adults do, they just need less pressure and a soothing voice of mum or dad. Baby massage is really essential it helps to keep our baby active and also keep their muscle and bones strong. Apart from that expert says that massage helps for good sleep also; therefore we used to do baby massage that helps our baby to stay fit and strong. In this above article we learn some crucial facts about baby massage I hope new parents should learn some better techniques and ways of massage. I would love to try this with my baby but she has Ezcema. Is Johnsons baby oil and massage safe and beneficial to dry Ezcema skin? Hi Lyndsey! I checked with a JOHNSON’S rep and unfortunately the JOHNSON’S Baby products are not tested for use of eczema, so they suggested you speak to your Health Care Professional for advice. Good luck!